In this picture is both life and death. 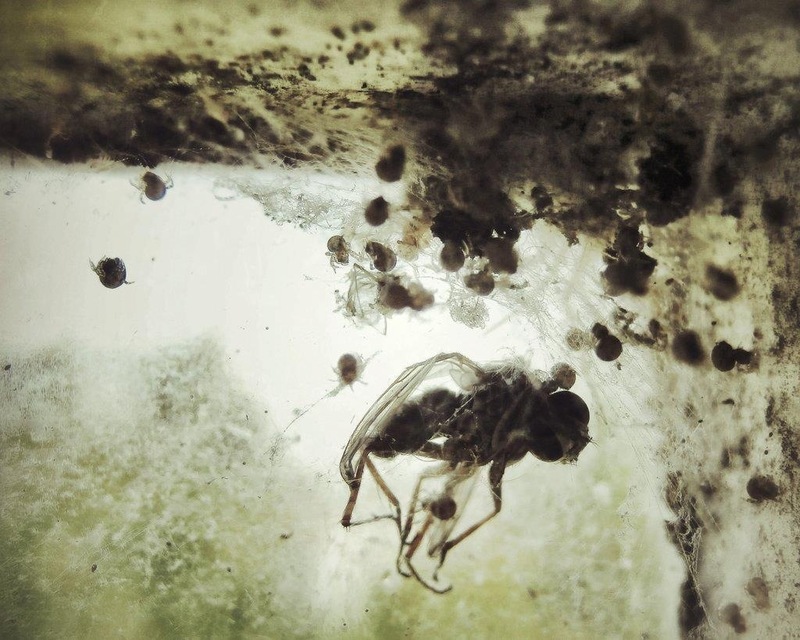 The rotting fly and the numerous newly hatched spiders that surround it. It is not a pretty sight, but it is real and it is what life is about. Not all of life is beautiful and sometimes it is ugly, just like the rotting fly caught in the spider’s web. Without a life and death comparative where is life’s meaning and where is its wonder. Where there is new life there is death waiting, threatening and menacing. To always focus on one or the other is unhealthy, we all need to have a balanced view. Yes that means looking at the ugly side of life from time to time. There is benefit in remembering your mortality. In the words of the Christian Ash Wednesday liturgy. There are always at least two viewpoints for every conflict and neither may be justified. I will not rejoice over the death of any person, whoever they are, whether it is seen to be “justified” or not. Death is never a celebration. I am horrified by what I have seen recently on the news of a fallen terrorist leader. Death is never the answer to conflict and in killing the process of conflict is fueled. I urge caution and respect to all on both sides of this conflict. At all times exercise restraint except in love, forgiveness and mercy. A reflection on the second TEDxDunedin event held 16 April 2010. TED has the tag line “Ideas Worth Spreading”, this was again true tonight. If I were to sum up the night succinctly it could be said like this… Don’t get stressed about what you do not have, live a simple but enjoyable life and when you come to leave this life make sure you have made your peace over what really matters. Andrew finished with an open call for dialogue around the question “What makes for a better society?”. Let me echo that call. Kate Wilson “The Measure of Happiness – and Other Unmeasurables”. The main message from Kate was that a happy life is not dependant on having things or more money or looking like this model or being rich. It is by working out your own values, that is what is really important to you. Contentment is not measured by commodities or consumer products or even the size of your bank balance. Money is not part of this question. Money is just a tool. The question to ask of yourself is “What is your measure of contentment?”. Richard Egan “How To Die Well”. The trend has been over the last few centuries that we are “living decades longer” but “dying badly” (especially long drawn out cancer and heart decease) and there has been a “growth on meaninglessness”. Spirituality and death can not be separated, one could say that death is in every way a spiritual act, whether there is a particular faith or belief the act of dying is deeply spiritual. To die well implies that one has to prepare spiritually while still alive. The spiritual is important and needs to be looked after regardless of personal belief systems. A question was asked “how do we prepare for death?” This is not easy to answer but each of us needs to search for the answer, as Socrates said “an unexamined life is not worth living”. I have personally had my brush with death as when I was five I nearly drowned and had to be rescued after I became unconscious , death now has no sting for me, I remember that it was very peaceful and knew I was in the safest place. I have a deep faith in God that sustains me. My father, who also has a strong faith, says “death is an exciting adventure waiting to happen” (he has a heart condition). The whole evening topics could be summed up Live well, find out what makes you content, help others on the way and know how to die well. This was another excellent night and thanks to all those who organised and hosted this night. Find out more about a TEDx event near you.